Buyer Beware: Georgina Quinton, Tiny Paws Designs, and etsy! If I had to summarize my experience with etsy seller Tiny Paws Designs in one word, it would be “nightmare.” Ditto: etsy’s customer “support” team. My husband and I care for seven rescued dogs and one ex-stray cat. (Well, it was “just” five dogs at the story’s outset, but our family has since expanded to include Mags and Finnick.) Those animals who enter our home without a proper name are named after our favorite pop culture icons: characters from books, television, and movies, famous musicians, etc. Mags and Finnick? Named after the District Four victors in Suzanne Collins’s The Hunger Games trilogy. O-Ren Ishiii, aka Cottonmouth, comes from Lucy Liu’s character in Kill Bill. (My personal favorite, even more so than The Bride.) Lemmy the cat is Lemmy Kilmister of Motörhead. And Kaylee and Jayne, as any self-respecting Browncoat would know, were so christened after Kaywinnit Lee “Kaylee” Frye and Jayne Cobb of Joss Whedon’s Firefly ‘verse. In spite of our atheism – or perhaps because of it – Shane and I celebrate Christmas in a big way. Only we call it FSMas and observe it with a Pastafarian twist. 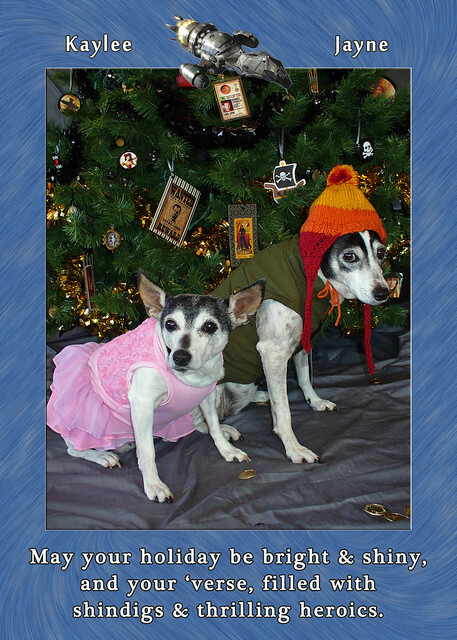 Every year we send out a holiday card featuring one or more of our dog friends, dressed in festive garb. First it was Santa and reindeer outfits, then pirates and chefs (both being integral to the Pastafarian “religion”). Ever since we adopted Kaylee and Jayne in 2006, I’ve wanted to dress them up as their characters from the Whedonverse and do a Firefly-slash-space pirates themed card. But mass-produced Firefly dog outfits don’t exist, and I’ve always been put off by the prospect of finding a designer to make custom outfits for me. Hiring someone to provide you with a service is always a risk – what if the job isn’t done correctly, or to your satisfaction? – but eventually, it was a risk I took. And lost. In 2011, I finally resolved to do it. At thirteen years of age and nursing a heart murmur, I don’t know how many more Decembers dear Kaylee will see. Now or never, right? So halfway through 2011 I started planning for a Firefly Christmas. I bought black and gold garland for the tree, ordered some new decorations, and made a whole tree’s worth of ornaments by hand. I found some sellers on etsy who hand knitted their own Jayne hats, and ordered three hats from two different shops (just in case one style worked better than another). 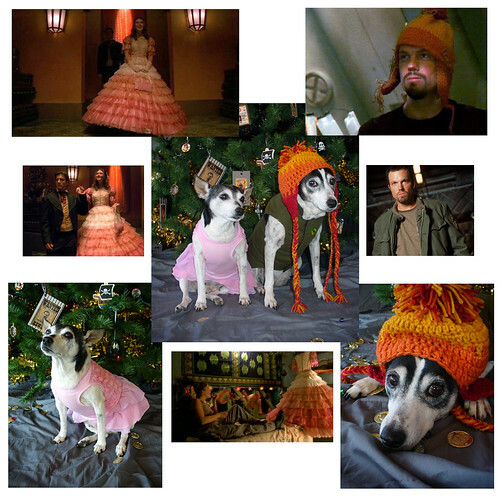 I searched online, obsessively, for any items of dog clothing that might be used in a Kaylee or Jayne outfit – pink dress, green army jacket, brown ringer t-shirt – to no avail. Only after I exhausted all my options did I start contacting dog apparel shops – both on etsy and locally, in the Kansas City area – about custom making outfits for Kaylee and Jayne. In my inquiry, I gave a rough deadline of November (“by November”); even though I don’t usually take the dogs’ Christmas photos until late November/early December, I figured an early November deadline would give me plenty of time to correct any problems, should they arise. Several shops expressed an interest in the project. Ultimately I chose Georgina Quinton at Tiny Paws Designs, based on her excellent feedback; the quality of previous custom orders she’d completed, including a blue crushed velvet jacket for a rabbit, a la Alice in Wonderland; and her apparent enthusiasm for the designs. I accepted her bid for the project on September 5th, and I sent the dogs’s measurements to her the very next day. We started reviewing fabric options online immediately. I was very clear from the outset that I know nothing about sewing, fabrics, etc., and would need some guidance in choosing the appropriate materials. Many of my early choices, for example, were rejected by Georgina because the prints were too large and wouldn’t work on such a small item of clothing (i.e., Kaylee’s shirt). There were issues with communication from the outset. On September 8th, when we were stilling going back and forth on fabric choices, Georgina mentioned that she had some pink fabric left over from a previous project that might work for Kaylee’s shirt. Problem was, she couldn’t send me a photo of it because her computer crashed and she hadn’t yet recovered all her photos. I told her to “Get back to me when you can [with the photos] and in the meantime I’ll think about the floral print and jumpsuit twill!” After nearly a week with no response, I emailed her (on the 14th): “Just wanted to check in & see what’s up since it’s been a few days since we last talked.” She responded on the 15th: “I guess I was waiting to hear from you”. This confusion and lack of follow-up proved to be characteristic of my experience with Georgina. After several more days of discussion – including some waffling on my part – we finally settled on fabric choices. Though she later complained that the fabric I selected for Kaylee’s shirt had no give and was difficult to work with, Georgina raised no such objections at the time – even though I plead ignorance in regards to fabrics and asked for her guidance and feedback throughout the entire process of selecting them. The seller put up a listing on September 19th, changed it at my request on the 21st, and I purchased and paid for the custom listing immediately. Once she had my money, I did not hear from Georgina for more than a month. On November 2nd, I messaged her to see how the project was coming along. She’d previously stated that orders from fabric.com usually take two weeks to arrive – so I figured that she would have already received the fabric several weeks prior and would be done (or nearly so) with the outfits by then. (Recall that my original deadline for completion of the project was November 1st. Even if you factor in the week I spent waffling between choices, the order should have been ready to ship in a few more days.) Her response? “I just got all the fabric in”. So either fabric.com took an exorbitant amount of time to ship her order; Georgina neglected to order it in a timely manner; or some combination of the two. Or perhaps she was exaggerating and the fabric had been sitting in her house, untouched, while my deadline passed swiftly by. Whatever the case may be, this is the point in the story in which I really start to worry that I won’t receive the outfits in time, if at all. Also not inspiring confidence in me: the fact that I have to reiterate to Georgina the details of my order, even though they can be found upthread in our etsy convos. ANOTHER week goes by. No shipping notice. Tracking info? Fuhgeddaboudit! I’m starting to panic. I’m convinced that there is no outfit. Not just that I’ll receive it late, but that I won’t receive it at all. I start to consider a Plan B. In spite of the stress and frustration, I have to laugh. The misspellings and lack of grammar remind me of someone faking a bad cell reception in order to escape an unwanted conversation: “What’s that I can’t hear you! buzzzzzzzzzz I think I’m hitting a dead zone. zzzzzzzz I’ll call you zzzzzz back. click” Right. Late at night on the 23rd – technically in the wee hours of November 24th – I received a shipping notice via PayPal. Even though Georgina claimed to have already shipped my order several days or even a week earlier, she miraculously paid for the shipping label after the fact. To date, this – a shipping label bought and paid for online – is the only proof she’s offered me that she did in fact make and ship my order. By now I know that I’ll be lucky to ever receive my order, let alone in time to use for 2011’s Christmas card. On the 23rd, I blow off work – I work at home, and my job is flexible, so I’m lucky that I can do that – and spend the day shopping for alternate outfits online. Finally I settle on a pink Cotton Candy dress for Kaylee (with a floral print shirt as backup, in case the dress doesn’t fit; Kaylee has a odd, misshapen body – one of the many things I adore about her) and a sleeveless Army Green Utility Jacket for Jayne, both from BaxterBoo. I also pick out a few Firefly patches and buttons on Amazon, to dress up Jayne’s jacket. Add in the previously purchased Jayne hats and I’m good to go! Or at least not totally screwed. Actually, I think I did a pretty shiny job, especially since I was working under stress and on a tight timeline. They weren’t the outfits I envisioned, but still – pretty good canine cosplay, don’t you think? Too bad I couldn’t find a frilly pink umbrella for Kaylee. Ah well! Georgina: “I have the same information you have. I have done my research on my end and get the same response. It was picked up and mailed during our storms and I am very worried. Because of this I have started to redo the entire order and even if you get this one, I am going to send a second one out. I don’t know where it is except to say I sent it and I will resend another order. Please let me know if you get it. I spent hours on this today trying to get it tracked down. Something has happened and I don’t know what. At this point, I’m frustrated and fed up. The holidays are fast approaching and I have things to do – not the least of which is photographing the dogs, designing the Christmas card, ordering the photos from Sam’s Club, and then assembling and mailing them. Since Georgina has promised to send me a replacement for my order, I decide to allow her the holidays to do so and pick the matter back up in the new year. No. Nononononono. She didn’t “ask” if she “could” make a second set – she outright stated that she would. There’s no room for confusion on this point. “Because of this I have started to redo the entire order and even if you get this one, I am going to send a second one out.” Zero. Confusion. Granted, I could have been better about hounding her, from start to finish. Perhaps, in reply to Georgina’s December 2nd message, I should have clarified that I expected to receive replacements asap. Maybe I should have been more of a jerk and harassed her daily throughout the month of December. But I was busy and stressed and sick of dealing with the entire situation. Also, my deadline was shot and my attention had turned to the outfits I did have. Stupidly, I assumed that “Because of this I have started to redo the entire order and even if you get this one, I am going to send a second one out.” was a rather unambiguous statement and she would be working on replacing my order, and so I backed off and gave her the time to do so. My mistake. Clearly. And so on January 11th, we go back and forth, with her promising to send a replacement the following week. Instead of USPS, I insist that she ship it UPS, since they have a better system to track packages – not to mention, more helpful customer service. But, if she must send it USPS, send it with a signature required to my PO Box, since I’m not always around to sign for packages. She agrees, UPS it is. By January 21st, I still haven’t received a shipping notice or even a progress update from her, as I’d explicitly requested this time. When I message her to inquire about the delay, she claimed that she was having trouble completing the order – or even contacting me – because of inclement weather and power outages. (I don’t know about you, but if my power went out this often, I’d seriously consider investing in a backup generator!) And that’s the end of the etsy convos! By this time, I’d already resolved to file a complaint with etsy; this latest delay, coupled with the utter lack of communication, was the final straw. And then, on February 2nd, I received another shipping notice via PayPal! As with the first notice, this one was purchased online – again through USPS, again to my home address (and, as I’d later learn, without a signature required) – even though Georgina had previously agreed to use UPS. We waited roughly a week for the package to arrive, in the meantime repeating the whole rigamarole with USPS, which was just as unhelpful as they were the first time around. Again, it appeared as though Georgina had purchased the shipping online but never actually shipped the item. After waiting a reasonable period of time for the mystery package to arrive, Shane got in contact with etsy about filing a claim. (I was so fed up at this point that he agreed to handle the matter from then on.) On February 17, 2012, we officially opened a “non-delivery” case with etsy – and that’s when things got really ugly. Georgina quickly went from calling me a “jem” and a “saint” to a liar and a thief. Granted, there was one point in our initial filing which I don’t blame her for taking offense. When opening the case, etsy’s form forces you to choose between two binary options; only later can you elaborate on the details. To the question, “Has the seller contacted you?,” Shane chose “No.” Georgina interpreted this as a claim that she hasn’t responded to our emails and messages; indeed, she has, and this isn’t what Shane meant. Rather, he was referring to the general lack of communication and updates. For example, the last etsy convo with Georgina has her indicating that the order will be late, and then…nothing. Nada. Just a mysterious shipping label, sent several weeks later, with no explanation or package to go with it. This is what Shane meant by “No, the seller hasn’t contacted us” – she hasn’t contacted us since our last correspondence, to offer an update or resolution to the matter. But this misunderstanding is wholly attributable to the limitations of ety’s generic forms – not any deception on our part. Georgina admits to never completing the second set of outfits, which begs the question: why bother purchasing a shipping label online? In fact, she outright refuses to complete the second set as agreed, and instead offers to refund my money minus the cost of the fabric, which she’ll send me. I decline; after all, I purchased completed outfits, not fabric, and have no use for the fabric anyway. (If I could sew myself or knew someone who could, I wouldn’t have hired Georgina now, would I?) She sends me the fabric despite my protests; I send it back, unopened. She refunds my money, minus the cost of shipping – shipping for 1) an item I never received and 2) a second item I explicitly told her not to send me. Some very nasty emails ensue. Throughout her correspondence related to the case, Georgina insists that she sent the original package – and then goes on to claim that, since it was never returned to her, I must have received it. I am scamming her (in her own words). However, the only evidence she’s offered to prove her case is the shipping label from USPS. This only proves that she paid for shipping – not that the item was ever actually shipped. Indeed, USPS claims that the package never entered their system. After we filed the case, we learned that Georgina purchased the second shipping label before she had any of the items completed and ready to send us! (See e.g., the convos from February 17th.) So there’s also that – she has a habit of buying shipping labels for orders that don’t exist. When we asked for proof that she actually made the items – a photo, for example – she scoffed at the idea: “It is not customary to make pictures of something like Easy Vegan wanted when I WOULD NEVER EVER SELL IT IN MY SHOP. Why on earth would I want them?” (February 28). How about as insurance? Proof that you made the items? Proof of what condition they were in when you sent them out? Or how about to use as a reference, to hold up to potential customers as an example of custom work you’ve done in the past? Look. I used to sell used books on half.com, and I ALWAYS photographed my items – whether they were worth $3 or $50 – before dropping them in the mail, just in case the buyer disputed their condition. It’s the smart thing to do. Plus, with a “500 gig external drive,” you’d think the seller would have plenty of room for a jpg or two. In contrast, while I can’t prove a negative – i.e., that I didn’t receive the items – I can offer plenty of evidence which indicates that I’m telling the truth. From early on in the project (see e.g. September 7th), I stated that I needed these outfits for this year’s Christmas card. When it became obvious that I wouldn’t receive them in time, I purchased replacement outfits from BaxterBoo. I have the receipts to prove it, as well as photos of the dogs in the outfits purchased from BaxterBoo (see above). Though I’ve been a buyer on etsy since May 2009, this is the first and only complaint I’ve filed against a seller. If I wanted to scam someone, wouldn’t I choose a more expensive purchase, such as the $120 I spent on cookies and sweets at Sweet V Confections? Initially, I requested – and waited more than a month for – replacement outfits. If my intention was to get a set of outfits for free, I would have asked for a refund at the very first. Considering the amount of time both my husband and I have poured into this claim – the back and forth with the seller and etsy (including many emails sent and phone calls placed directly to etsy, to which Georgina is not privy), the countless phone calls to USPS, the time spent writing this post and uploading supporting evidence – this “scam” would have earned us less than minimum wage. Not exactly a big score. Trust me when I say that all this time, stress, and frustration certainly hasn’t been worth the $63.70 we’ve received back thus far, nor would it be worth the $75.85 we paid Georgina. I’d much rather be working (and getting paid for doing it! ), reading, writing, blogging, spending time with my dogs, or fixing up my house than typing this sentence right now. It’s the principle, not the money. In fact, I don’t want anything to do with the money! Today (March 30th) I’m donating the entire purchase price – not just the partial amount refunded to us by Georgina, but the entire amount I paid for the items – to Friends of the Friendless in Lexington, Missouri. This is the group which rescued Kaylee and Jayne; but for their selfless work, we wouldn’t have these wonderful girls in their lives. I don’t want Georgina’s money, but I bet Gina could put it to excellent use. And yeah, I’ve got receipts for that too. That’s how you prove your claims – with evidence. Despite the overwhelming evidence in our favor, after several weeks, etsy (mistakenly) closed the case, because 1) we’d received a refund (it was partial) and 2) the seller shipped the item (wrong! she sent me fabric, not completed outfits). Unsatisfied with the outcome, Shane persisted in calling and emailing etsy outside of its case division (for example, trust). Though he got various representatives to all but admit that the case was closed mistakenly, they insisted that they were powerless to reopen it – “our hands are tied.” Likewise, while the deadline for leaving feedback (90 days) passed while I was waiting for Georgina to make and send me the replacement outfits, etsy wouldn’t budge on that, either. Powerless to bend their own rules, even though they’re the ones who make the rules! While this post might seem melodramatic or so much overkill, my inability to leave the seller the negative feedback she so richly deserves is the main reason I decided to write this. Other potential customers deserve to know what I went through, so that they can make an informed choice about whether they want to do business with Georgina Quinton. Or with etsy, for that matter. Call a phone number to talk to an actual human, get referred to their web site. Find another number there, get a recording. Finally reach a real live human, get rewarded weak excuses: “Well, most of the transactions on etsy go smoothly.” Yeah, but true test of the quality of company’s customer service doesn’t come when things go right – it’s how they respond when everything goes wrong. etsy’s response? Lackluster. I haven’t disabled my account, but I very much doubt that I’ll ever use etsy again. Certainly, I won’t recommend them to my friends, family, and readers as I have previously. In fact, if you need to purchase a custom item or something particularly expensive, I will actively discourage you from using etsy. If you have a problem with your order, most likely you’ll have to rely on the seller’s good graces to do what’s right. Don’t expect any help from etsy, if my experience is any indication. By the by, some of my favorite vegan etsy shops have a presence elsewhere on the web. No Whey! Candies? Also doing business as No Whey! Chocolates. The Radical Uprise? They’re on Store Envy, too. Point being, I’ll take my business directly to them from here on out, and I hope you will too. Before you etsy, Google. Find the shop’s own website and give all your dollars directly to them. As long and rambling as this post is, it’s only a bare bones account of what happened. For the actual emails, etsy convos, receipts, etc., head on over to the evidence page. I’ve published every bit of info to which I believe I have a legal right; unfortunately, this excludes all of our exchanges with etsy staff. Home addresses, phone numbers, and other personal info has been redacted. Where appropriate, I’ve added commentary to point out inconsistencies and half-truths. Finally, after careful consideration, I’ve decided to close the comments on this page. I’d rather not have to deal with this issue from this point forward, and moderating comments would force me to do just that. If you’d like to share your own experiences with etsy, send me a link to your post and I’d be more than happy to post a link roundup below.